This is something I do with my students at the end of each module and I thought it might be something some of our network groups might like to try. It’s somewhere between speed-dating and a normal critique session. One module I’ve used it with recently is Writing Novels for Young People. Students have to produce a 500 word synopsis and 3000 words of the novel. If the 3000 words ends mid-scene they may, outside the word count, add a contextualising note. For all sorts of technical reasons they may not write just the first 3000 words. In SCBWI groups we’re more likely to be dealing with a synopsis and the opening three chapters. This will work just as well. Participants should bring along a hard-copy of their manuscript double-spaced printed on one side only and some coloured pens. Typically I work with a group of 15-18 students. This can work also with a smaller group. 2. Is the resolution satisfying? 5. Characters. Are they consistent? Do they develop? Do you know everything about them that you should? 6. Is it convincing? Is there cause and effect? 7. Is there conflict and tension? Are there peaks and troughs? 8. Does the pace vary? 10. Detail and description should be slipped in small chunks. 11. Point of View – is it consistent and if it “zooms” does it do so in a reasonable way? 13. Kill off your darlings. Stages 1-4 are mainly to do with the synopsis, the rest to do with the 3000 words / three chapters. As you’ve probably not had a “week before” you might want to discuss briefly what you understand by each stage. · Everyone person passes the manuscript to the person on the right. · You give everyone a number up to 16. This is the edit they start with. If they finish before you stop them, they can go on to the next stage. · You time ten minutes and then everyone passes on their script again. 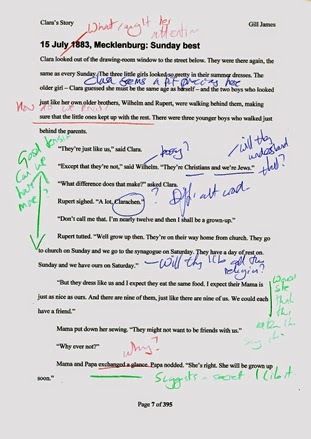 · Everyone begins the next edit on the new script. · If possible, every edit should be conducted in a different colour. At the university we work for two lots of fifty minutes. Seminars are one hour fifty minutes long. They start on the hour and finish at ten to the hour so the room can be cleared for the next class. We have a ten minute break - comfort break, time to go and fetch a coffee or some people need to go and light up. I always provide some goodies to help the energy levels on these sessions. You can make yours a different length. Ninety minutes with a short break might be ideal, especially if you need some time to clarify the stages of editing. It is really quite effective. Participants bring in what they think is a submission-ready copy and go home with a lot more new ideas. And it’s fun. In a non-university setting it might be nice to have lunch afterwards or hold the event in the back room of a café that serves wonderful treats. And naturally you can adapt it for a type of text. 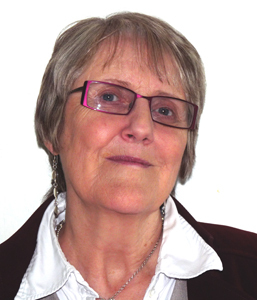 Gill James is the Programme Leader for English and Creative Practice at the University of Salford. Her latest Young Adult / Adult crossover book The Houe on Schellberg Street was published by Crooked Cat in April 2014. What a great idea, Gill! Thank You. The name comes form German - a story about education, literally. Arguably it was invented in Germany - Wilhemmeisters Lehrjahre. A story of growth and change. Most ya books seem to do that and indeed most of the time it is to do wiht the young person confirming their identity.